“That Dress” : Not neuroscience, if you saw brownish and blueish … camera effect, I think. And got these 3 sets of colours. Can you guess which is the question post and which was the “original dress” image? 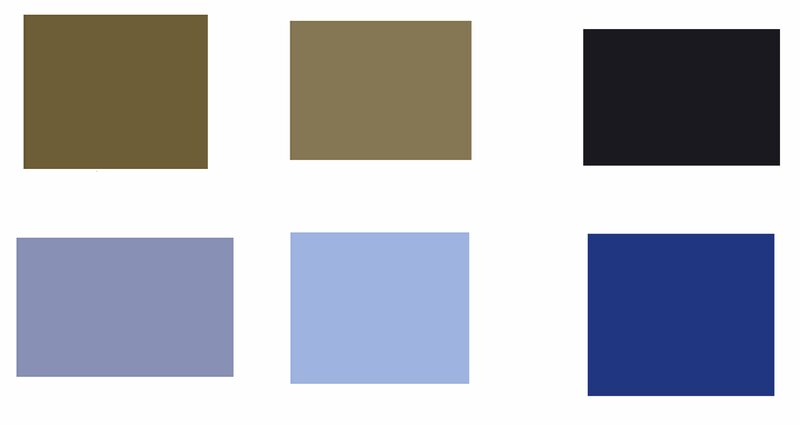 Note that the neuroscience effect is noticable – the swatches may seem darker than the perceved colours on the question posts’ dress image. But it takes talent to see the top left swatch as black. In different parts of the images, I found different specific shades, but all in the same groupings : for example, for ” black” locations the web image in question had hue about 30, saturation 50 to 100, and light about 50 to 90 with slightly higher R (110 – 140) than G and half to two thirds the B as R ; while the “the original dress” web image on the Slate for black had saturation and light about 20 to 50 and hue about 160 to 180, with R and G about 30 to 40 but with B slightly higher. I think it would be interesting to do a study correlating the responses to such a colour question with personality, including personal response to social pressure. Do those who want to be different “see” less likely suggestions? Do conformists “see” what they are told most people see? Do those who see purple cats (when the cats are purple) resist incorrect suggestions? In other words, the differences may be more social science than neuroscience. Ceri Vergeltungswaffe I do disagree on one point – it does not take talent to view the top left swatch as black. It takes a poor colour display on a digital device. Or it take growing up with digital devices where “black” is really just super-low saturation and one has become used to adjusting. The subconscious process of “it’s black in context” is the same as the checkerboad “are these two squares the same” illusion.